All equipment that can be connected to computer networks (computers, routers, servers, printers, smartphones and so on) have a MAC address. It is an address which is written into the network interface of the device during manufacturing. A has the value 10, B means 11, C means 12, D is 13, E is 14 and F has the value 15. 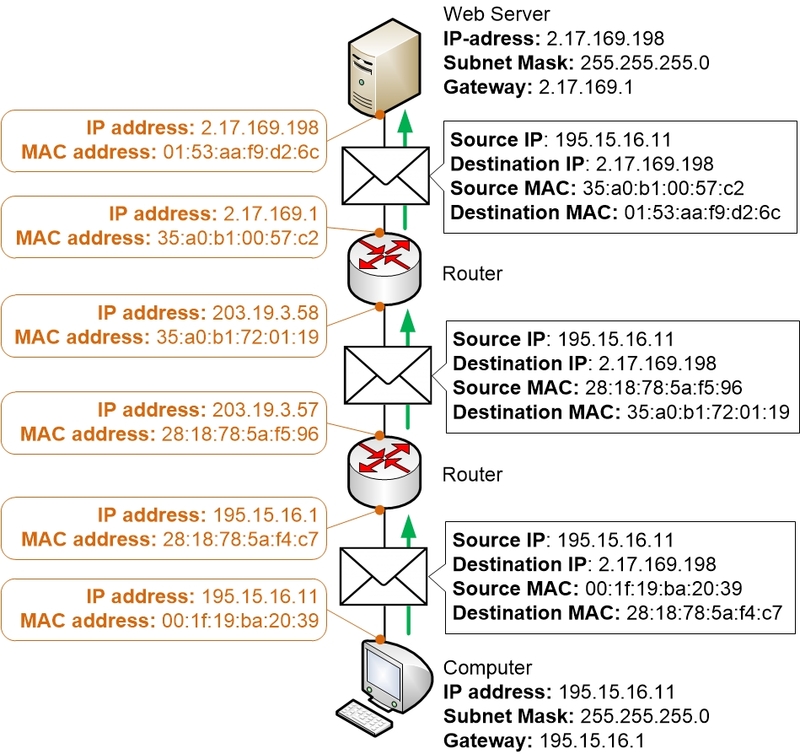 MAC addresses and IP addresses are two completely different types of addresses, but both are used by computers that communicate with each other. 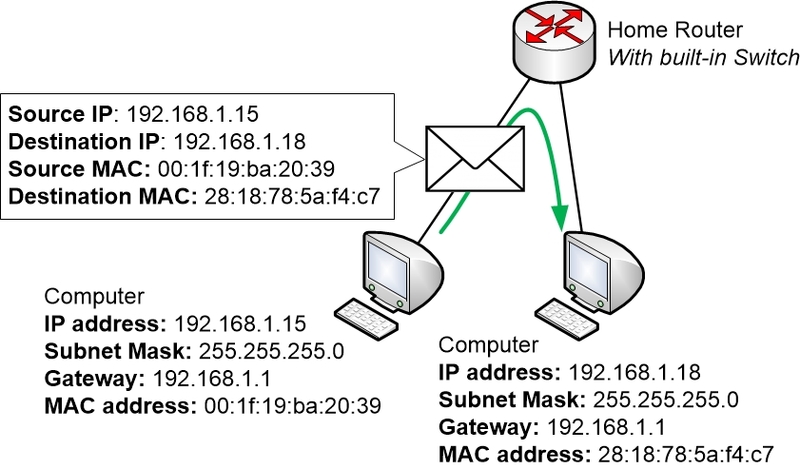 Each time a computer sends out network traffic the traffic has both a source and destination IP address, but it also has a source and destination MAC address. IP addresses are relevant on a global scale. They hold the final destination of the packet and can tell us which address the packet is originally coming from. In contrast, MAC addresses are used on a more local scale, and hold information about the next hop destination in the local LAN network. The difference can be compared to a journey to a final destination (IP address) where you can have multiple legs of the journey, each time stopping temporarily at interim stops (routers with local MAC addresses) before moving on. An IP packet travelling over the Internet has many such temporary stops along the way in different routers that the packet must pass through. Each router forwards the packet to the next router on the path until the packet has reached its final destination. The destination IP address on the IP packet must always stay the same throughout the whole journey, in the same way that the delivery address of a letter that is being sent cannot be changed along the way. The delivery address stays the same until the letter has been delivered no matter where along the delivery path that the letter is currently at. But even with regular letters, the postal delivery service must use temporary destinations or next-hop addresses where the letter is going to be delivered next. The mailman who fetches the letter from the mailbox is not going to deliver the letter straight to the recipient. Instead, the mailman will fetch the letter to a mail sorting office. 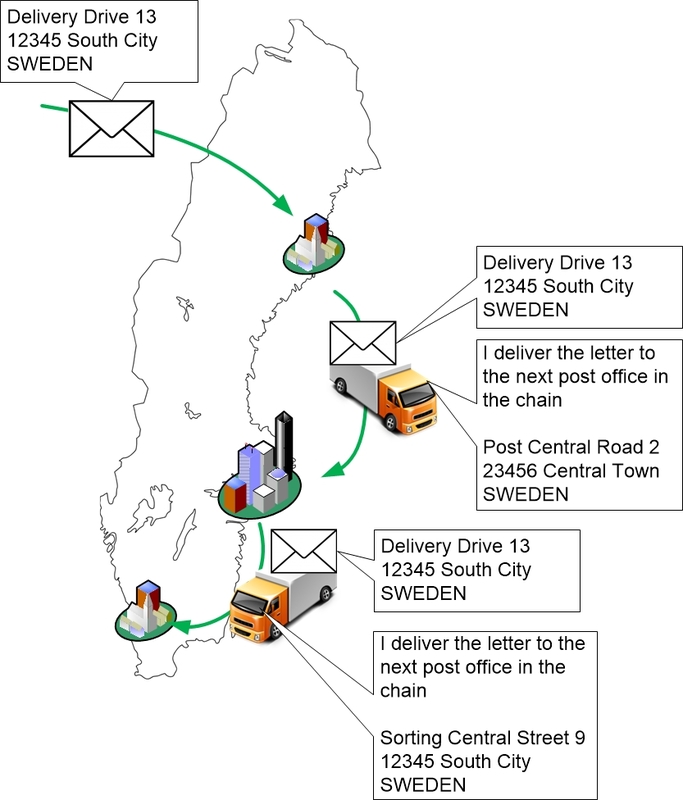 So even though the letter has a final destination address, the mailman will take it to another more temporary stop along the way where the letter can be sorted for further delivery toward the destination. This can be repeated multiple times, with the letter passing by several such temporary next hop addresses before it is finally delivered. In computer networks, it is the role of the MAC address to act as the next hop address on the local LAN. The mailman is replaced by Switches in the network environment. These switches can be located in a local LAN, or sit between routers on the Internet. The switches do not deliver packets based on the destination IP address. Instead, the switches look at the destination MAC address to see where it should send the packet next. When a computer has a packet to send it knows the destination IP address where it wants to send the traffic. But the computer must also make sure to add a destination MAC address to the traffic which points to the next hop router. This is how the computer makes sure that the packet will end up at its default gateway. When the router receives the packet it will look at the destination IP address of the packet. Based on that destination IP address the router will know which way to forward the packet and which the next hop router will be. Then it can strip off the old destination MAC address (which was the router’s own MAC address) and replace it with a new destination MAC address that points to the next hop router. So Source and Destination IP addresses don’t change as the packet is transmitted and routed over the Internet. The MAC addresses, however, are being changed for each new local network that the packet traverses as it is being sent between each pair of routers on its way to the final destination. It is worth repeating that MAC addresses are always used in combination with IP addresses – even within small LANs where two computers want to communicate directly with each other.